Finding a quality “wine bar” in Barcelona is like finding a tapas restaurant without cured Spanish ham, challenging! For me, a quality wine bar isn’t about pomp and flash, nor is it about who can have the most wines from Rioja. A quality wine bar doesn’t need an attractive metrosexual god donned in a pressed black apron with his hair perfectly gelled to one side serving wine enveloped in a Riedel goblet, nor does it need trendy chillout music in the background to set the mood. What the ideal wine bar does need is quality and affordable wine by the glass served by a knowledgeable and passionate host who’s created a low key and friendly environment for all walks of life to experience. Literally squeezed into a tiny little space the size of a Smart Car, its conspicuousness will taunt you as you frantically search the windy Barcelona streets in vain. But once your wine loving radar does hone in, take a moment to revel in its quaint and cozy environment. Exposed brick walls, wooden bar stools and the smell of cured meats and cheeses linger in the air. With a total of 12-14 wines of various styles on display, each and every one available for tasting by the glass, it’s an opportunity to get your palate acquainted with fun, innovative and interesting wines that you normally won’t find either on a menu or by the glass. What do I equate with interesting? What about a stellar lineup that includes a wine or two from Seville?! Seville is located in Andalusia, southern Spain, and internationally renowned for producing amazing sherry wines, but not table wines. Historically, table wines from this area have lacked in quality, but we’re happy to announce this is changing, and at Zim. Colonias de Galeón is run by Elena Viguera and Julián Navarro in Cazalla de la Sierra, the very center of Seville’s Parque Natural de Sierra Norte is a modern project using international grapes. It’s an ecological winery that produces 4 table wines: 2 reds and 2 whites. 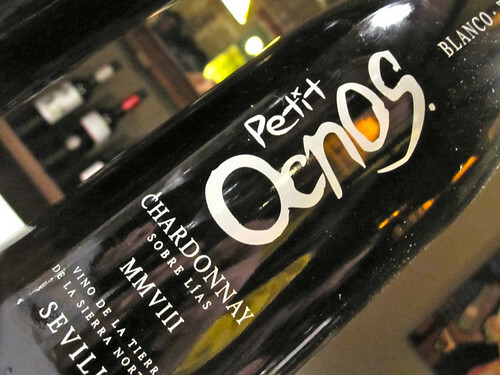 Having tasted both their Chardonnay and their Roble made with Cabernet Franc, Tempranillo, Merlot and Syrah, I can attest to their surprising quality. While the Chardonnay is nice the Roble is still a bit too…Roble (roble means oak and refers to wine that are only briefly aged in barrel). To see Katherine’s face as she speaks these words with both determination and pride is unforgettable. Part of the reason why we adore her is because, like her cheese shop, she only sells what she loves. And what she and Francesc both love are high quality products made naturally and priced fairly. 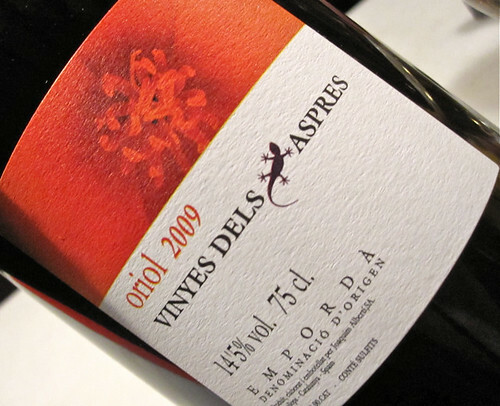 The most expensive wine on their list was the 2006 Corbatera from Montsant priced at 18.00 euros. It’s a 100% Garnatxa and well worth its price. Bar Zim also served us a 100% Verdejo from Bodegas Shaya. Overflowing with aromas of lime, orange blossom and raw almonds, this wine is bright, festive and seductive with a round, rich mouthfeel and a long, lingering mineral and citrus finish. 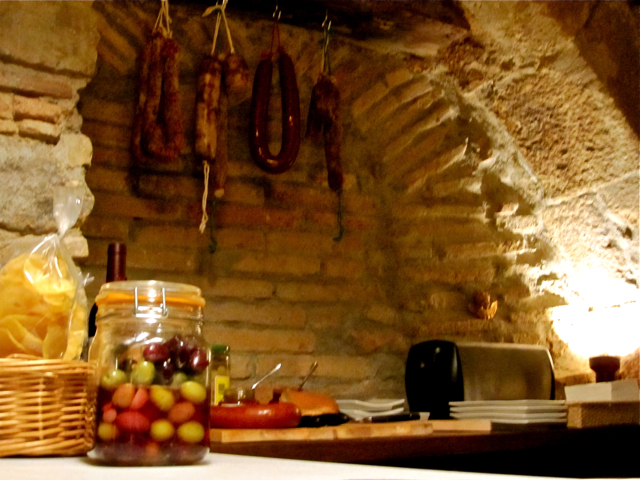 The perfect pairing with Bar Zim’s ‘petó’ (small kiss), a small housewarming tapa filled with varying concoctions. Ours consisted of a chorizo and sobrasada stuffed roll. And guess what, it was delicious! What’s truly unique about this tapa is the mere fact that tapas don’t come for free in Catalunya. This is a Spanish, not Catalan, tradition; hence, the gesture alone should be recognized. One must also consider that Bar Zim went through several trials and tribulations to find the perfect bread, and breadmaker, for their creation. To the layman, baking a small little roll should be a piece of cake (or bread, as it were), but according to Katherine, it was anything but “easy”. But no matter how the creation came about, we’re thankful for its savory, spicy and tender interior perfectly balanced by its sweet and slightly crunchy exterior. And if hunger still grips your innards, why not savor one of their rustic sausages or chorizos from Cal Rovira located in the Pyrenean foothills (on our list of places to visit), juicy pimientos piquillos from Navarra, hot guindilla peppers from Pais Vasco or simply, a hunk of delicious cheese from her shop not a few doors down?! So with all this fabulous gushing about Bar Zim, there must be some drawbacks, right?! There are a few. Bar Zim doesn’t have a phone and lacks internet presence of any kind, as exemplified by my Flickr photos coming up on the front page of Google, instead of their website. However, the domain name has been bought, and evidently, a website is in the works. So stay tuned. Additionally, it can get crowded quickly when you only have enough space in the entire bar for you and a few friends. So as long as you’re in the right frame of mind, as you should be for any bar in Spain, all is well! Keep in mind, however, that drinking on the streets is illegal if you are not within a certain distance of the bar. So even when the temptation strikes to bring a glass of wine out into the cool Barcelona streets, think twice. Unless Katherine and Francesc put in a patio area, I fear you’re required to get in the festive mood and squeeze your way into the bar, which might be a perfect way to meet new friends!! Saturday: They’re experimenting with evening hours, but nothing set in stone.